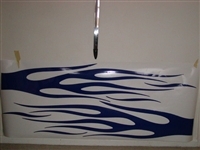 Dodge Ram Flame tailgate accent Graphic decal fits on any year Ram or Dakota with a Ram head logo on it. FLAMES SKULL GRAPHICS SET HOT!! FLAMES!! #9 You pick your size!! You pick your size and color! 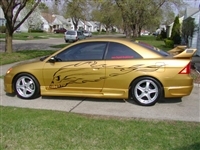 Like flames and skulls ??? Today you have them both in one great graphics set!!! Flame #9 FLAMES! You pick the size! Save HUGE $$$$ Retail is $89.99!! - $249.99!! Flame #8 FLAMES! You pick the size! Flame # 7 FLAMES! You pick the size and color! Save HUGE $$$$ Retail is $89.99!! - $249.99!!! Flame # 7 FLAMES! You pick the size! Made with Top Grade 3M/FDC vinyls! 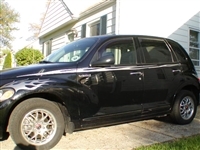 They run from the hood the back of any year P/T Cruiser or HHR This set of flames will fit on any car or truck ! 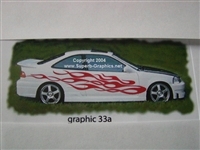 Set includes 2 flames one for each side of your hood so it will look like the photos when installed. Size 22" wide X 34" long each for a total installed size of 45" wide X 34" tall. This graphics set will fit all Year and any Model Trucks!